A ready-to-use nutrient solution, specifically formulated to support long lasting flowers. 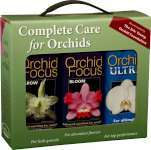 Orchid Myst is a revolutionary new way to provide orchids with all the necessary nutrients - both mineral and organic. It is also probably the best way to feed orchids, informed by the way orchids receive nutrients in their natural environment. Misting of the exposed roots and trickling through the growing medium imitates the forest environment and is the natural way for orchids to obtain their nutrients. This solution is carefully formulated to support and prolong flowering.